The history of the cross of vine shoots, given to Saint Nina by the Theotokos, is known. 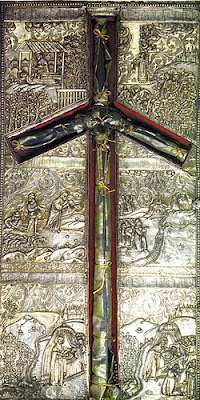 Until 458, the cross was kept in the cathedral church at Mtskheta. During the time when the Christians were persecuted by the fire-worshipers, a monk, named Father Andrew, took the holy cross from Mtskheta and conveyed it to the province of Taron of Armenia, since at that time the Georgians and Armenians were of one belief. * The cross was kept in the Church of the Holy Apostles, which is called by the Armenians Gazar-Bag, that is, "The Tempe of Lazarus". Afterward, on account of persecution from the Persian Magi's, who were exterminating anything Christian, the cross was taken south of Tbilisi and hidden at Armenian fortresses at Kapotsi, at Banai, at Kars, and the city of Ani. These movements took place until the mid-1230's, when the queen of Georgia, Rusudan (Rousouda, d. 1237), and her bishop besought the Mongolian overlord Tsarmagan (Jamukha), who occupied Ani, that she might return the cross to Georgia from whence it came. Permission was granted, and the cross was placed at the Cathedral of Mtskheta. However, it remained there only for a short time. On account of the frenzied madness of the barbarians, it was necessary for the cross many times to be taken and hidden in the mountains. On one occasion it was taken to the Church of the Holy Trinity, which exists to this day on the small mountain of Kazbek, north of Tbilisi toward Chechnya. On another occasion it was at Kastro, Ananour in the old temple of the Theotokos. In 1749, Metropolitan Romanos of Georgia fled from Georgia to Russia, secretly taking St. Nina's cross and giving it to Queen Bakar Baktanovitch, who was then staying at Moscow. The cross then remained in the village of Liskovo for fifty years with princes from Georgia, who were the descendants of Bakar and had migrated to Russia in 1724. Prince George Alexandrovitch, the grandson of Bakar, in 1801, brought the cross of Nina to the autocrat Alexander Paulovitch, who thought it good at that time to return the great and holy treasure to Georgia. To this day it is a symbol of the apostolic toils of St. Nina. ** The vine cross was deposited in a silver case at the Sion (Sioni) Cathedral of Tbilisi, next to the north pillar of the sanctuary. On top of the case may be seen the engraving of scenes from the saint's life and miracles wrought by the cross. * In 505-506, at the Council of Duin, both the Georgians and Armenians rejected Chalcedon and went into the Monophysite camp. However, in 607, under Archbishop Kyrion I, the Armenians and Georgians split, and the Georgians returned to communion with the Greeks, which resulted in close contacts between Byzantium and Georgia, while relations with the Armenians were often strained. Oxford Dictionary of Byzantium, s.v. "Georgia"; Lives and Legends of the Georgian Saints, p. 5. ** The faithful of the Georgian Church interpret, in a typological manner, the cross of vine shoots given to Saint Nina by the Theotokos at her commissioning. The grape vine, a multivalent symbol, is pictured in many Georgian icons, engravings and frescoes. Christ says: "I am the vine, the true one,... and ye are the branches" (Jn. 15:1, 4, 5). An example of Georgian symbolic thought is that the vine branch connects Saint Nina with the fruit-bearing vine of the Gospels. It is a symbol of evangelical teaching - the new wine. Furthermore, it refers to the Eucharist and the cup of martyrdom. In Georgia, a nation known for its vineyards, the vines extend to the mountaintops, symbolizing the enlightenment of their land. In addition, the Georgians believe that when St. Nina wrapped her hair about the cross, it was a sign that she became a slave of God, and not of men, and that she would deny herself, offering her life in service to God. From The Great Synaxarion of the Orthodox Church (January), translated by Holy Apostles Convent, pp. 459-460.